Nicklas Bendtner, originally uploaded by Ashburton Grove Blog. 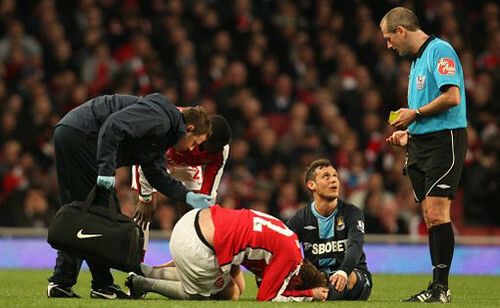 Not much around this today but there is worrying news that Nicklas Bendtner was injured in the game against West Ham last weekend. The giant Dane came off after 58 minutes. It didn't look like he was struggling, but then perhaps he was still high on the adrenalin. However he has not trained all week because he twisted his ankle. John Cross broke the story in the Daily Mirror. "I hope to be able to train with the others Thursday or Friday, but I'm not sure that it will go so well." Lets hope if he is not back for Birmingham, he is fit to face Barcelona on Wednesday. Another striker making noise in the media this morning is Loic Remy, of French side Nice. Apparently we made a move to sign him in January, but the price wanted by his club was too high. "Arsenal are the club I want to join. I won't deny they are my priority. "Arsenal are a young, ambitious side and I love to watch them play. "It is the ideal place for me. I spoke with Thierry about them and asked him lots of questions about life there. "That is because I have been an Arsenal fan since I was little. I was not disappointed with what he told me." I would be surprised if he did sign for us as it seems we have the deal to sign Marouane Chamakh wrapped up. But you never know where our priorities lie in the summer. Sol Campbell has been talking about our trophy challenge and how this team can go on and win the title. He's been talking with the Independent. "The lads are playing really well and I am sure with their talent, they can play even better. "However, playing fantastic football all the time is great, but ultimately it is about what you can get out of your career. "Young players have to realise pretty quickly that it is not about one game, but how you perform over the whole season. "It is a youthful team and has to learn quickly at this time of the season, because the games come thick and fast - once a game has gone, it is gone. If you win, you have to get your feet straight back on the ground and grind out another win. You can enjoy the moment, but remain level-headed and always think ahead to the next challenge. "Every team has it own kind of frequency, and obviously there were different players [when I left] in 2006. "Now the lads are young, enthusiastic and blessed with a lot of skill and talent. They have a lot of spirit and belief too, like the team before. The belief has definitely started to come, and everyone can feel it. "The manager often talks about belief, but it takes time for it to sink in and for people to really believe." Meanwhile Andrey Arshavin has responded to headlines in yesterday's papers with a quick quote. "I do not understand English very well, so I do not understand what is written in the newspapers. "I am just focused on my preparation and performance in the games, that is it. For me, there is no pressure." And reports in Italy suggest Inter Milan want to sign Cesc Fabregas, with a £36m player-plus-cash deal including Italy Under-21 star Mario Balotelli being mentioned. I suggest they can keep their money and their player. We won't be selling Cesc any time soon. And finally, the Daily Mirror say Mathieu Flamini would rather stay in Italy than come back to England. "My priority is Milan. I follow with interest the big English clubs - but I'm at a legendary club, feeling good."